Nanakoko or Busoga site in Bukoli, the origin of the name Busoga and also where the British Protectorate headquarters were located among others. 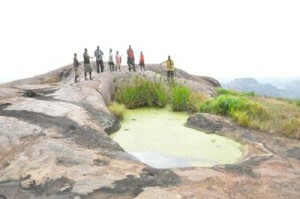 In an effort to boost the tourism in this region, Busoga Tourism Initiative (BTI) was established and Kagulu Hill was selected as a tourism icon for promoting tourism in the region. Kagulu Hill is one of the many rocks in the regions found 130km from Jinja in Buyende District. Kagulu Rock: It’s such a majestic rock elevated as high as 3,600ft making hiking as challenging yet interesting and rewarding once you find yourself atop and treated to amazing views. 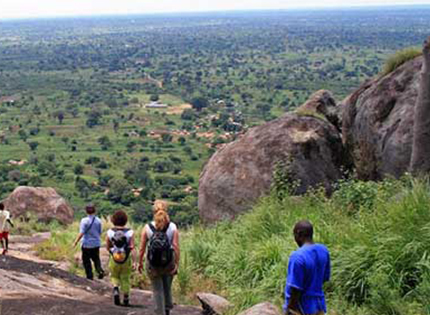 Breathtaking sights await you atop Kagulu Hill, these include the waterfalls flowing from the ancient caves and the sight of Lake Kyoga at a confluence with River Nile. Caves: The ancient caves were home to the early settlers, and the rock is believed to have been the first place where migrates settled in this region, which is a true place where the Busoga tribe emerged and thus holds a strong cultural heritage. At this point one is entertained by the fireplace stories, of when the caves was discovered way in 1686 in the reign of Olimi the King of Bunyoro, its believed that the King spent most of his leisure time on Kagulu Hill. Iddi Amin’s Trail: The hill gives visitors a chance to walk in the footsteps of Amin the most famous former President of Uganda. It’s said that Amin wanted to build himself a palace atop the hill where he could easily communicate to his people across the Kyoga while having an eagle eye’s view on Teso and Lango region, a concrete structure atop the hill, a communication center setup in 1972 and concrete staircase still exist. Kagulu Hill is not only a beautiful rock but has a strong cultural value and it’s at this point that you will understand the source of the Busoga culture and it’s history. Kagulu Rock Annual Climbing Challenge 2nd edition is yet to take place from 9th – 10th May 2014. The event will include many more activities bicycle racing, quad biking, camel riding, camping, a trade exhibition and music performances by the local renowned artist Jose Chameleon who was selected the Ambassador of the BTI, along with other cultural artists. All will be done in two days from May 9 to May 10—the climbing day. The Busoga Tourism Initiative organizes annual Kagulu Rock climbing challenge, its such a big event that attracts high profile participants like the President of Uganda. The first challenge took place on May 11 last year after the first ever tourism and cultural expo was held in December 2011 where more than 28 potential tourist attractions were listed. Gorilla & East Africa Safari work hand in hand with the Busoga Tourism Initiative in providing tours to the different sites most famously the Kagulu Hill, our tours run daily and one need to spend atleast 3 days or more to enjoy the entire package. To take part in the 9 -10th May Annual Kagulu Challenge event this year, you simply need to book with us latest by 7th May 2014. Do not miss this opportunity and fun! !